Well, it’s almost here . . . that magical day, Christmas! We sure are having a great time getting ready at our house. Hope you are too, my Sweeties. 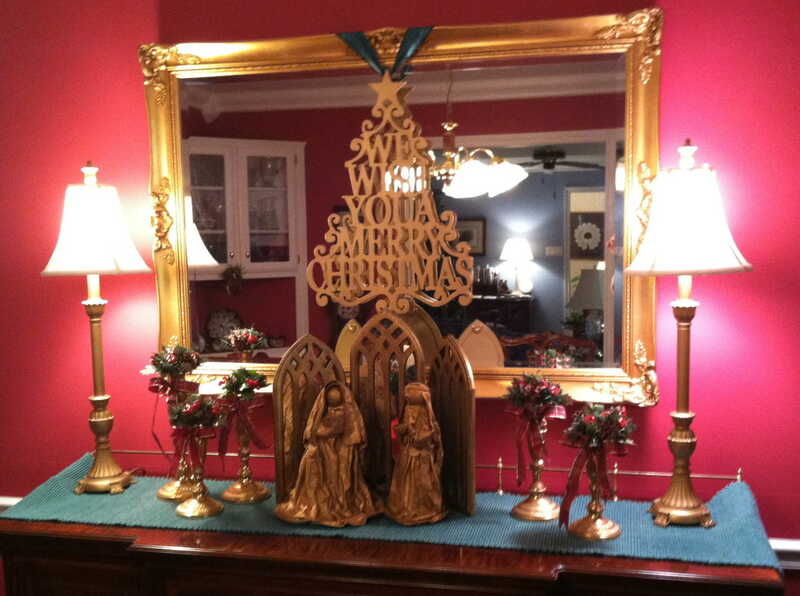 This year I was motivated (by having a choir party at our house) to decorate as I have never decorated before. I mean I love holidays. You know I do! 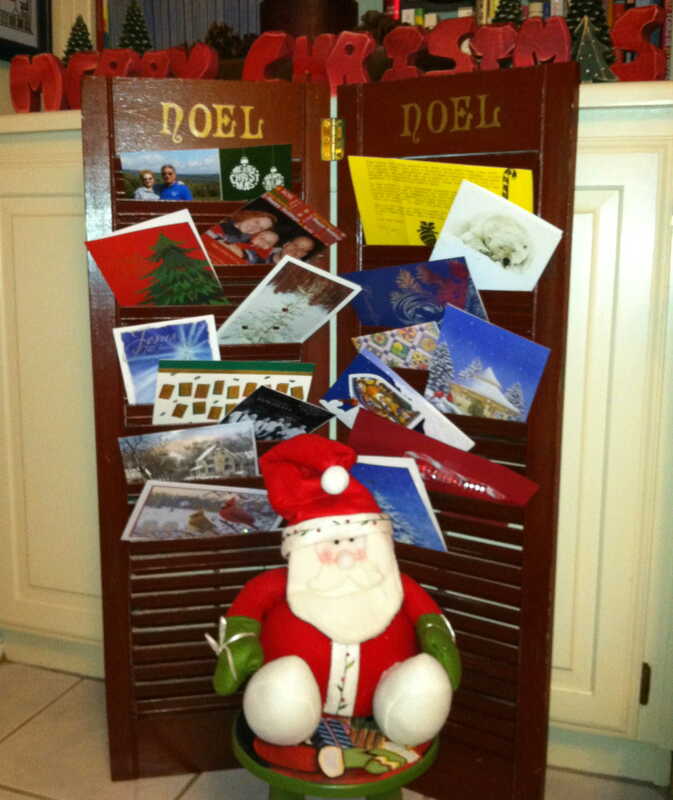 But I have used every bit of glitz and glitter in all the boxes to doll up my abode for this Christmas. Gramps and I have been enjoying the atmosphere and I thought you might enjoy seeing it too. 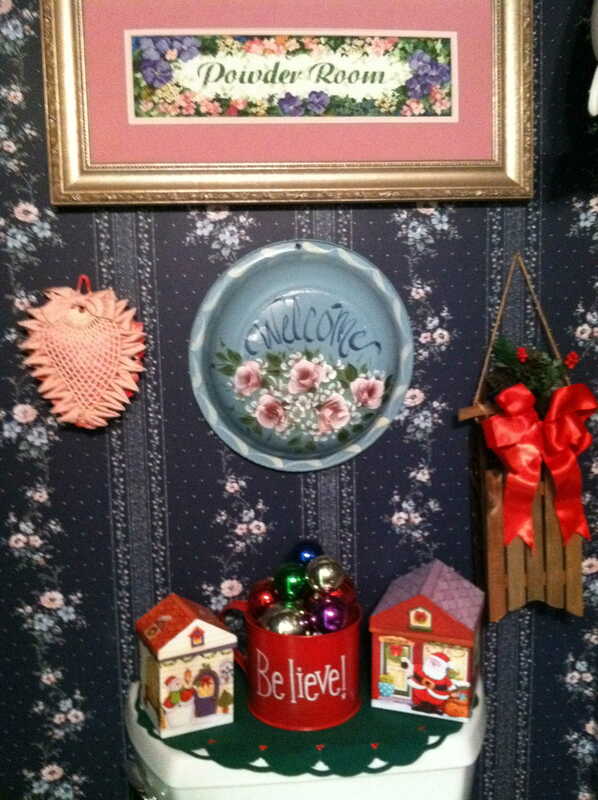 So welcome to Granny’s house! 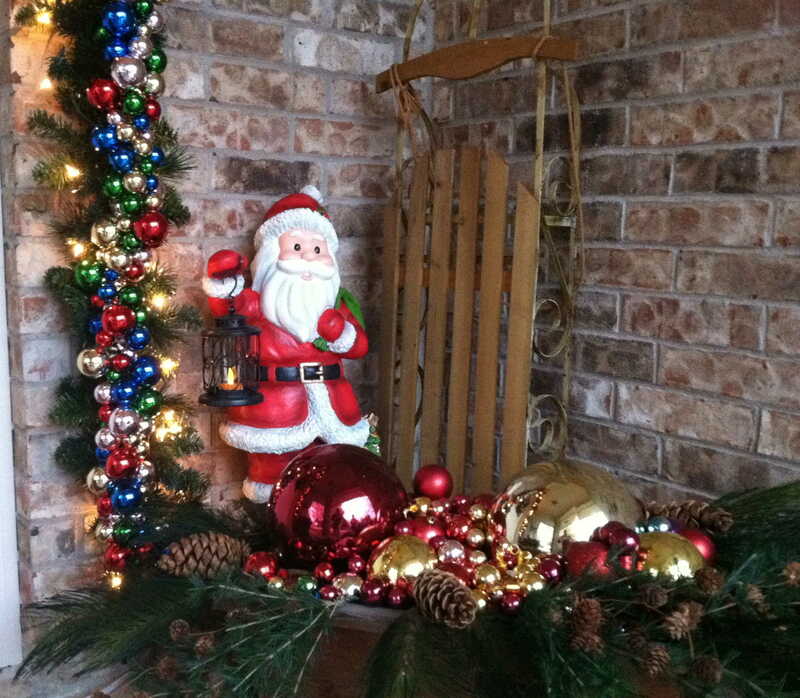 Santa welcomes everyone in! 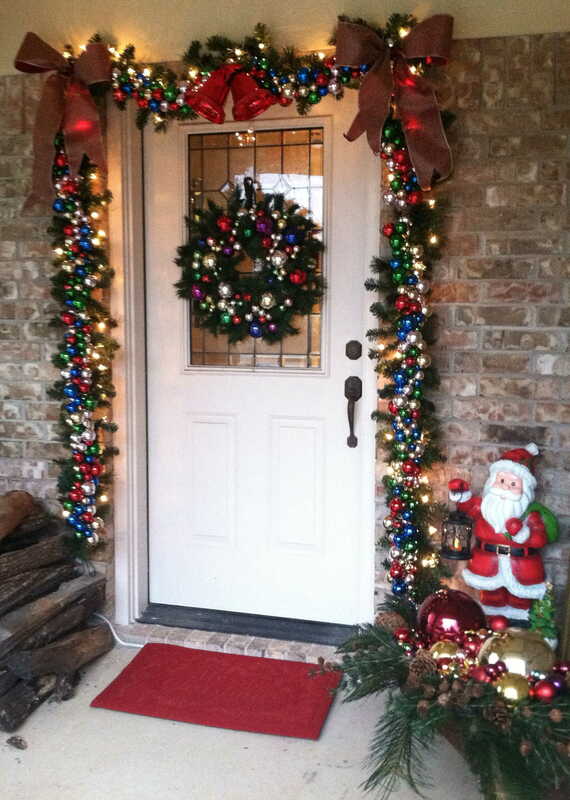 This is the first year I added lights to the front door. I don’t know why it took me so long. They look wonderful! The front hall. This creche is so old . . . let’s see . . . about 40 years . . . can that be right? . . . yes, 40 years old! I made it during my ceramic period. 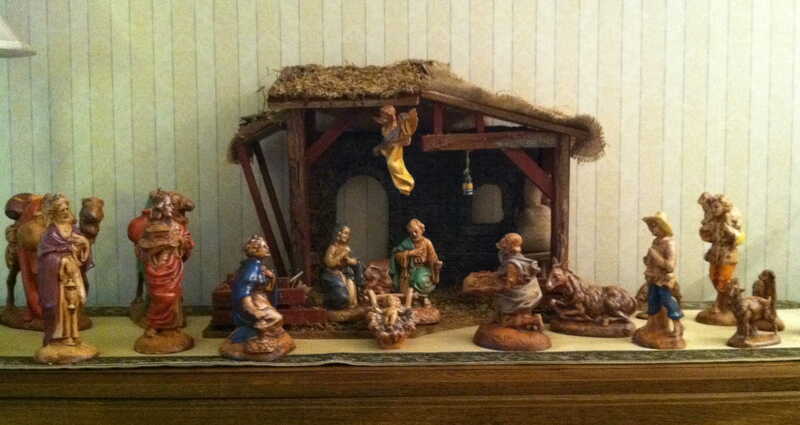 I love nativity scenes and have them all over the house. The tree. (The big tree. There is another.) We had to get a skinny tree to fit the space, but I love how elegant it looks. 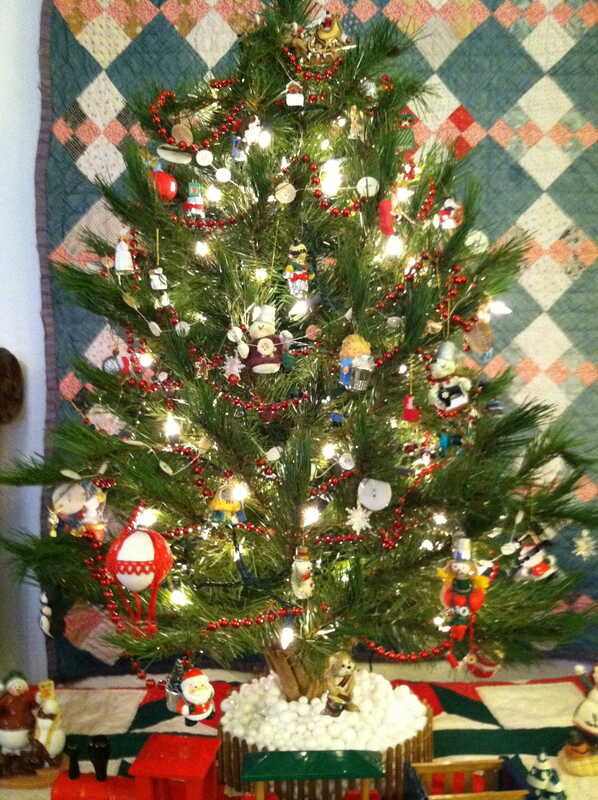 The tree is full of old, new and handmade ornaments. 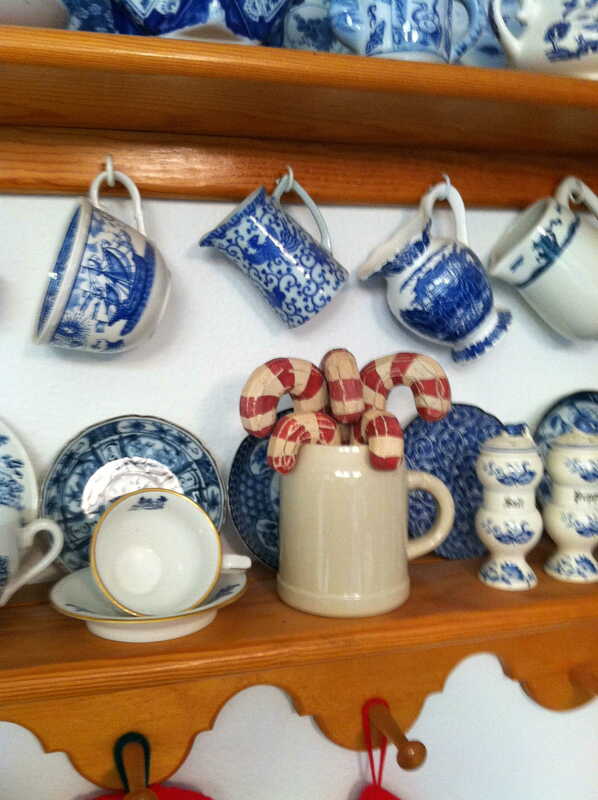 I love the eclectic, gathered look. 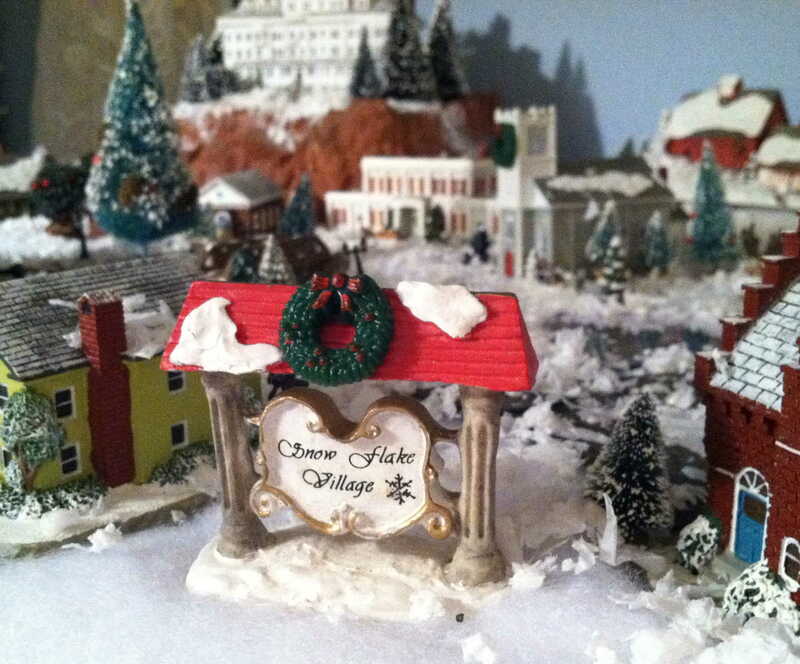 There are many Thomas Kinkade house ornaments that have lights shining from them. They all look so cozy and warm in their own little nooks. And tinsel . 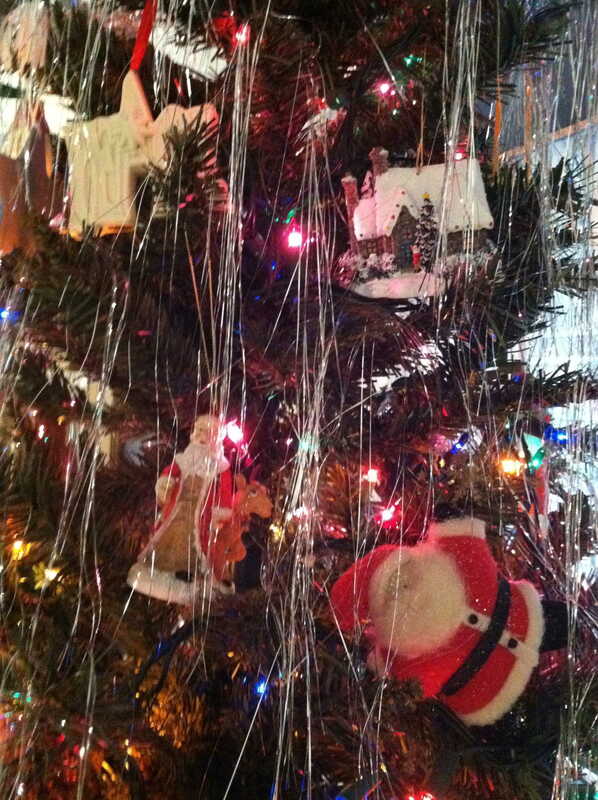 . . lots of tinsel! Our children used to take a handful, toss it up and blow it on the tree. Gramps and I have never been able to master that skill very well, but we try. 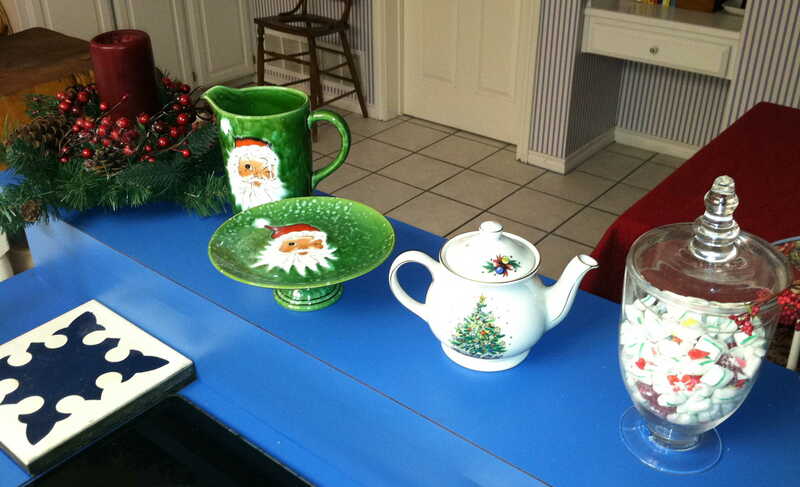 My sweet Santa collection! 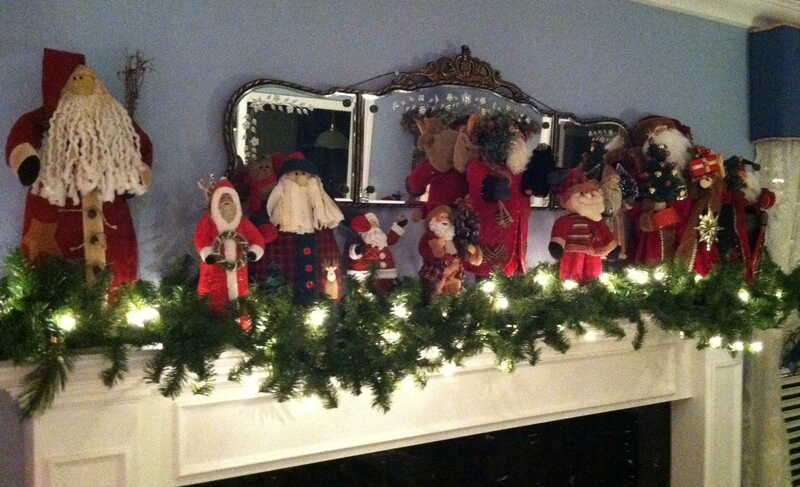 It has taken me many years to finally get this mantel to look like this. I had a vision in my head and this is it! I even made a couple of these little guys! 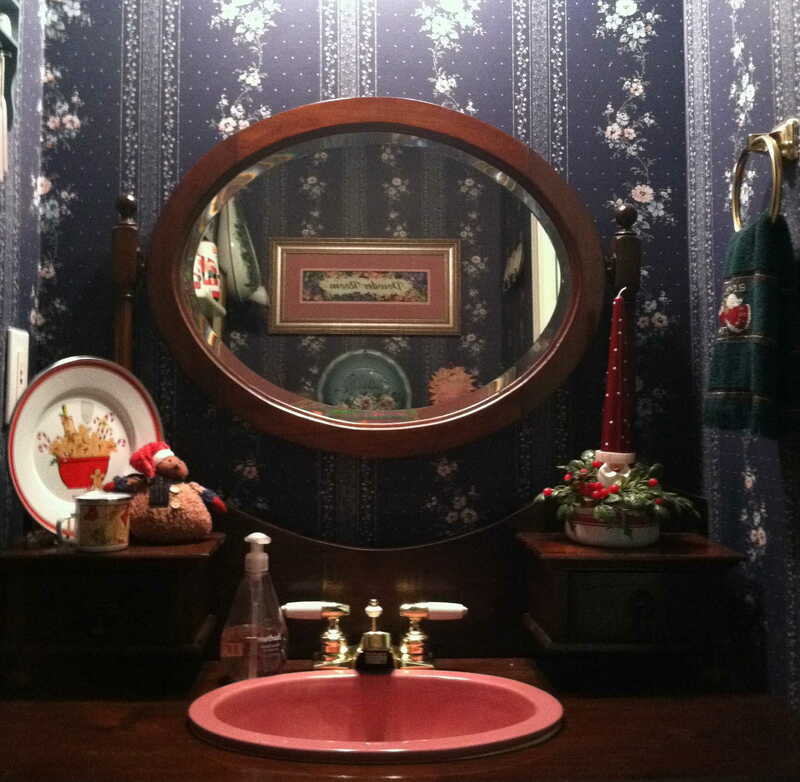 And they are so nicely reflected in Aunt Gladys’ antique mirror. I love it. Welcome to Snowflake Village . 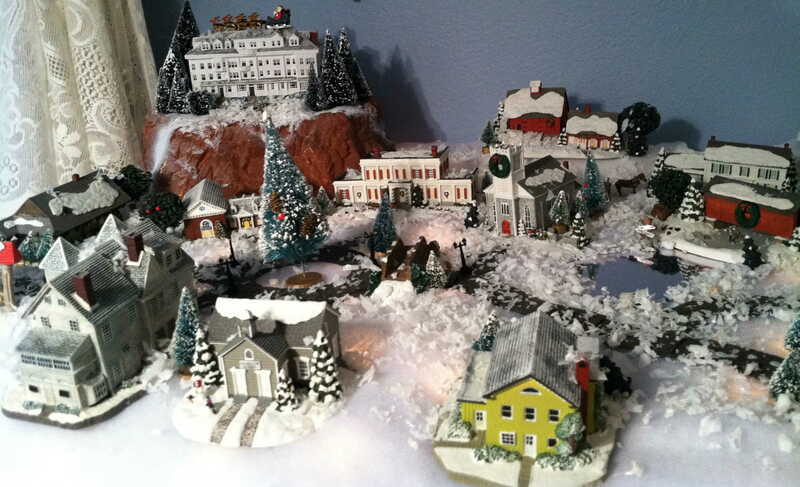 . . the miniature town that appears every year. Most of the pieces are replicas of the buildings from Norman Rockwell’s hometown . . . which somehow seems sweeter to me. As if people actually lived in them at one time . . . I know, Granny’s getting old! Anyway, the grandkids love this village and always look for every detail, i.e. mailboxes, horses, street lamps and the one skater that has fallen on the frozen pond. 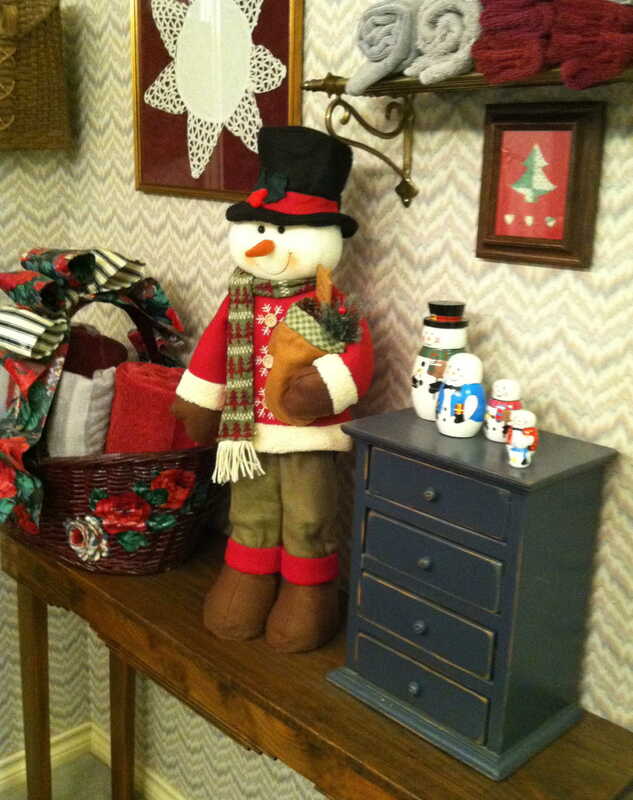 It wouldn’t be Christmas without the Snowflake Village at Granny’s house! 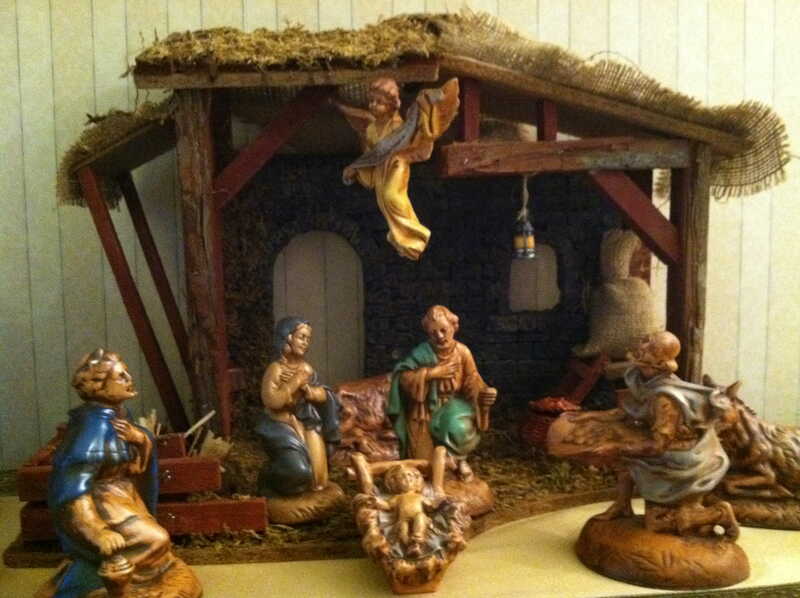 Here is another creche that I love because a dear friend of mine made it for me and because it depicts children. This always reminds me of the many Christmas plays we sat through when the kids were little. So sweet, it made your teeth ache! Shelf decoration in the living room. These votives look spectacular with candles in them at night! The lace pattern is beautiful! I didn’t realize how beautiful when I bought them. What a nice surprise! On to the dark pink dining room. Once I painted this room this yummy color, I loved it so much, I began to tell everyone that every house needed a “red” room. And many people have come to see the truth of that statement without any arm-twisting needed! 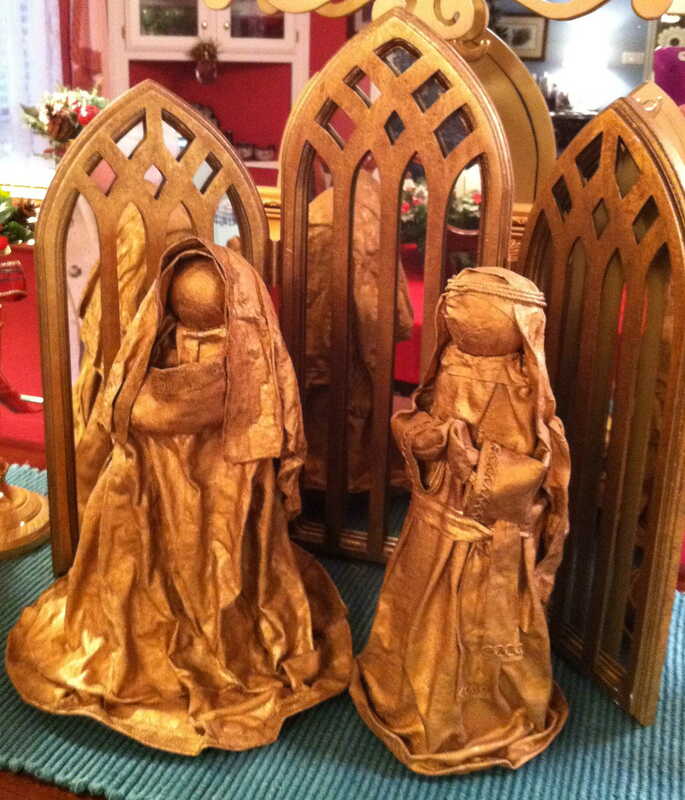 The mache Mary and Joseph are probably 45 years old. 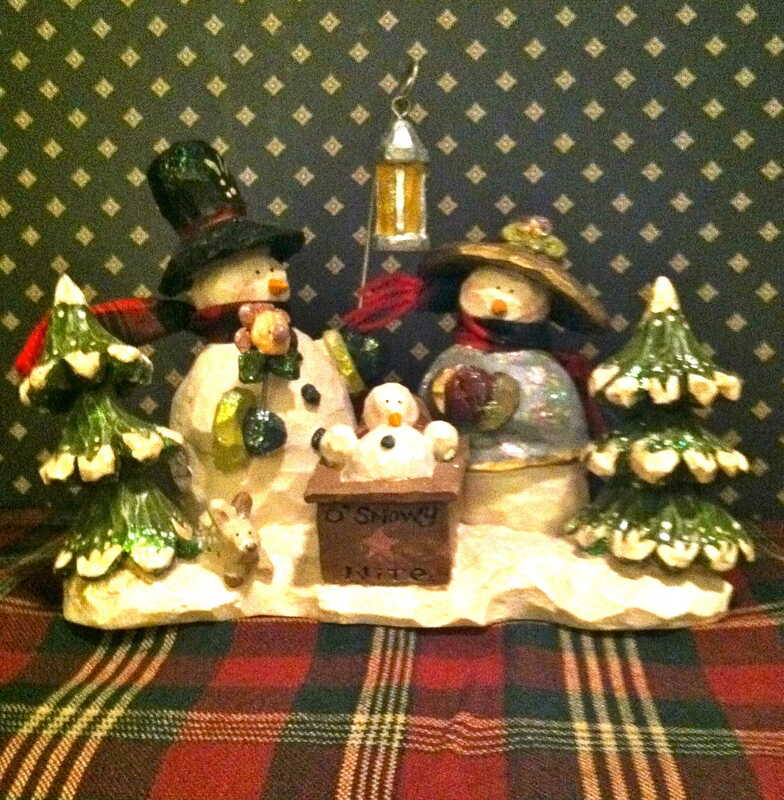 I made them for my mother when I was in college. They have adapted to the new decors around them nicely. I just realized as I was looking at the previous photo that the candles that were burned down during the party have not been replaced. Please imagine tall green tapers in the brass candlesticks on the buffet. Alas, dear Sweeties, Granny is not perfect! 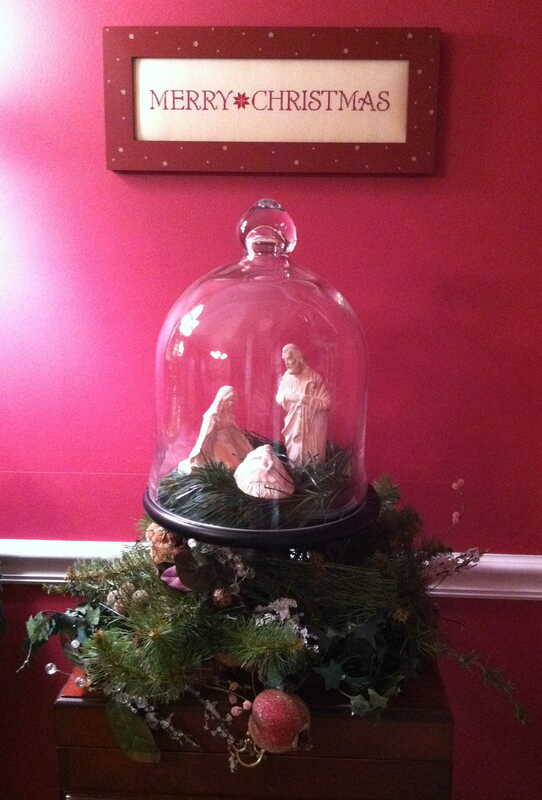 More photos of the dining room and another small creche under a dome. 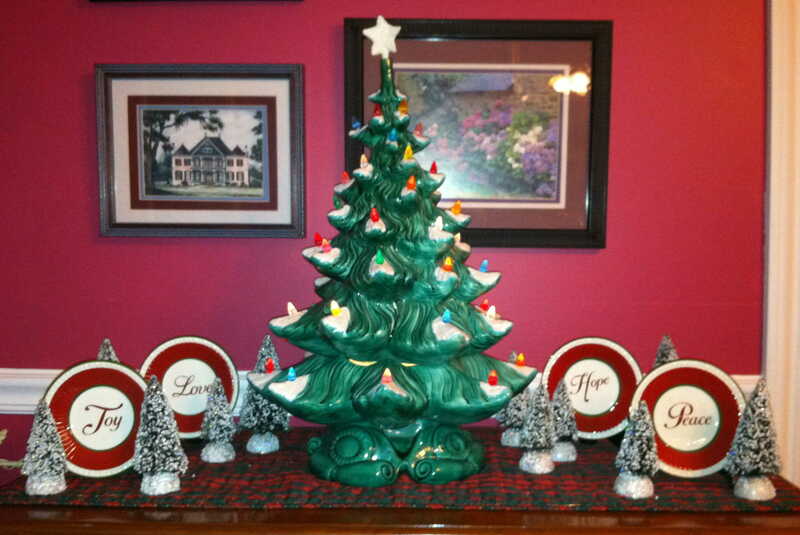 This one was also made by my dear friend who passed on several years ago. I miss her still. 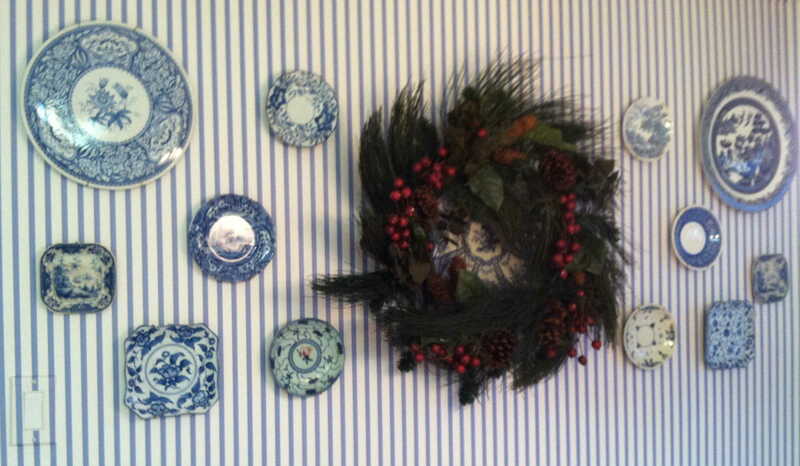 The kitchen is bright and festive with greenery stuffed here and there. 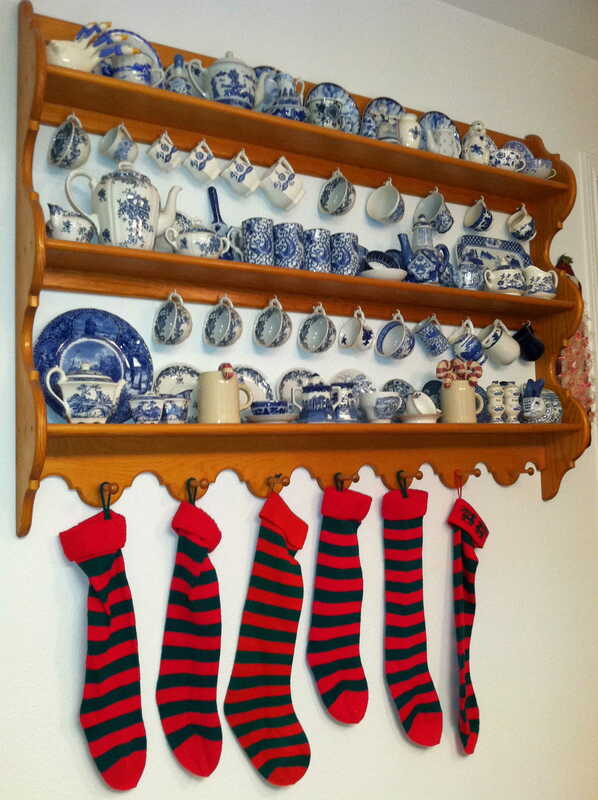 The striped stockings on the dish rack were purchased in different places and at different times. It amazes me how alike they all are. 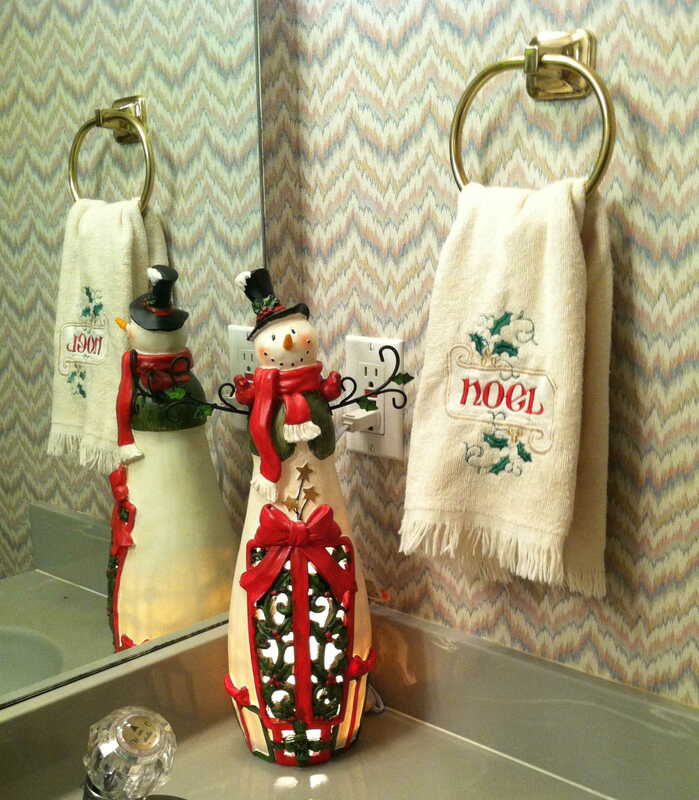 The powder room off the kitchen is small but I love putting a touch of holiday cheer in there. Don’t mind the painted bedpan! 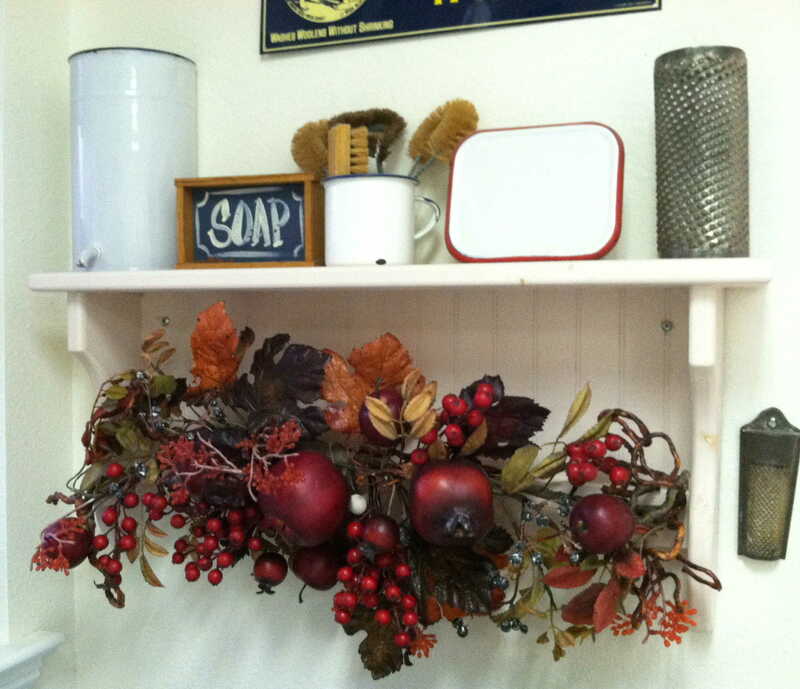 Even the laundry room gets a little bling! I told you I was on a roll! Into the den, where you will see “Candy Corner.” I love the candy theme and so do the children, although none of it is edible! So sad! 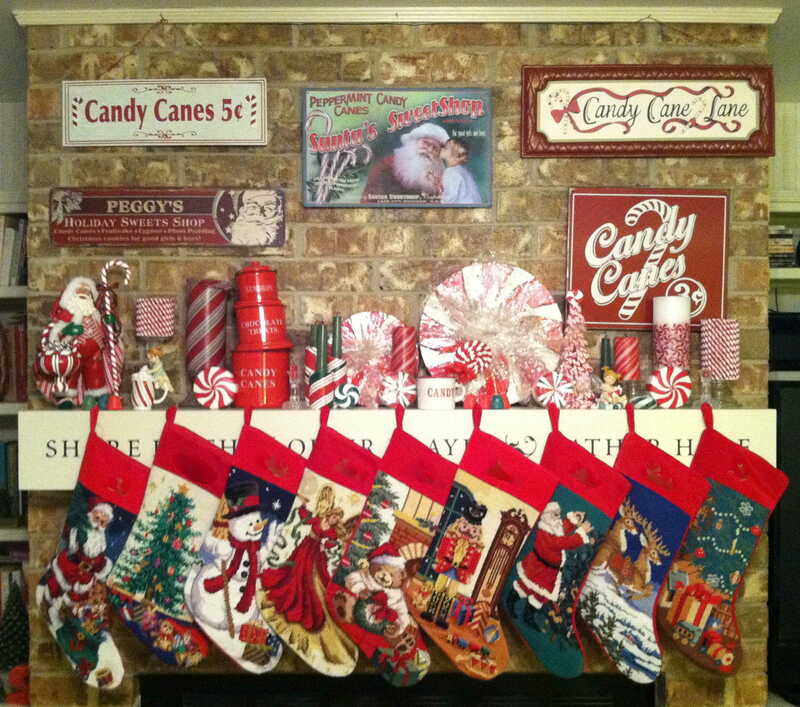 There are now 9 of us with my son getting married in june, so “all the stockings” means a mantel-full. The card holder is made from a set of shutters. I’ll have a tutorial on that at some future date. 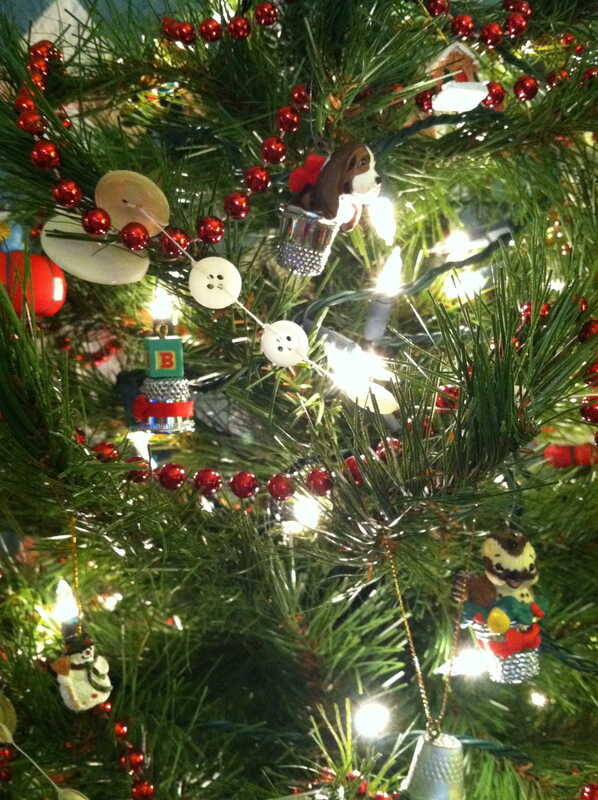 This is my “sewing tree.” The ornaments are all miniature and most are thimble-themed. This year I made a button garland, which really adds an extra spark. I’ll give you a tutorial on that too . . . later! The little wooden train is a favorite of my “boys.” They expect it to always be there on the trunk in front of the “sewing tree,” where they can get to it and play with it. I wouldn’t think of having it anywhere else! 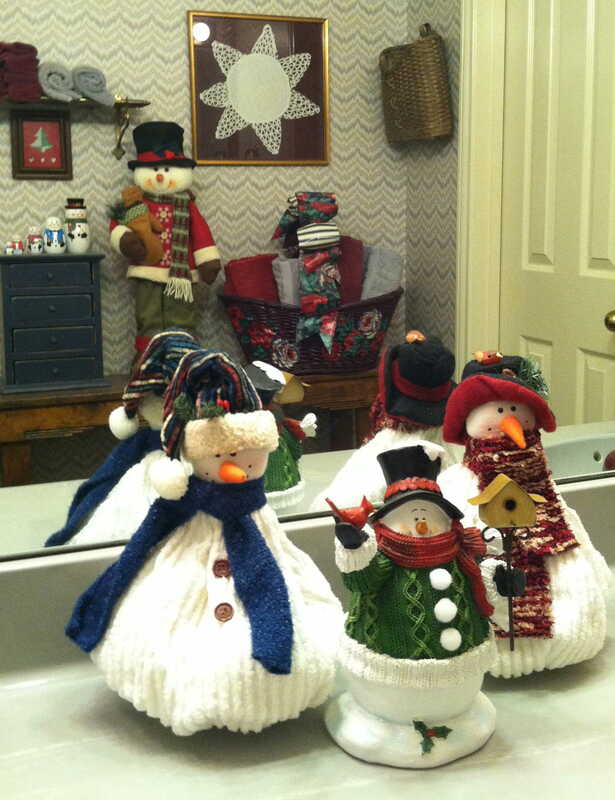 Can’t forget the bathroom with its snowman theme. Aren’t they cute reflected in the mirror? 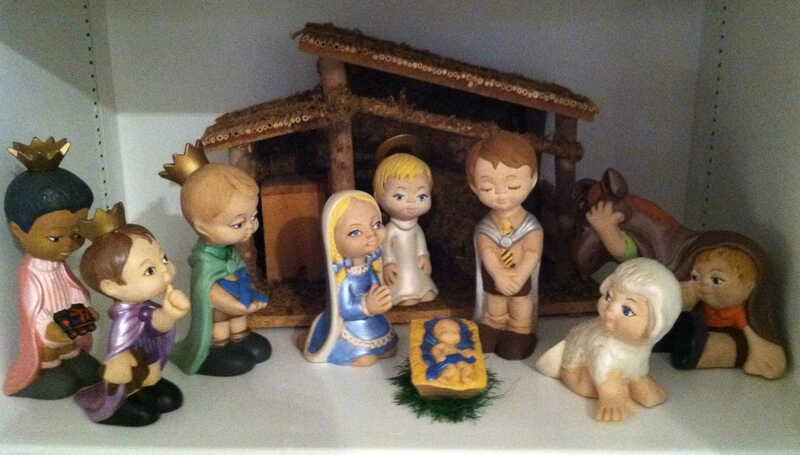 One last creche. One of my favorites. Too-too cute. Well, that’s it . 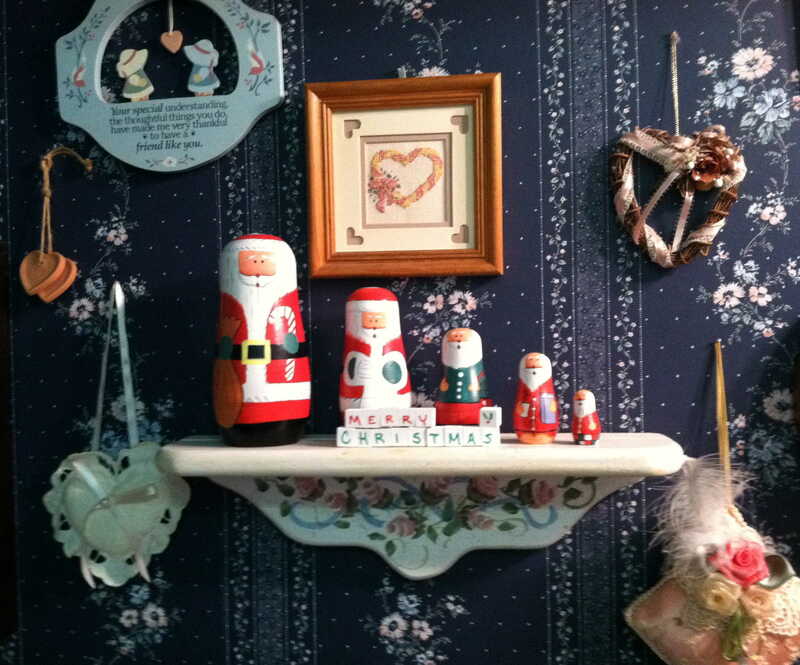 . . Granny’s Christmas house. You have to imagine the warmth of a fire, the aroma of banana bread baking and apple cider simmering on the stove. Now conjure up a loving hug from Gramps and me, and a hearty “sit a spell and chat with us” to get the full effect of the holiday here. We’d love to share it all with you, my Sweeties! All of you, I’m sure, are in the process of putting up your Christmas trees (or will soon, or intend to, or have partially decorated one or still have yours up from last year!) Wherever you are in that process, it can seem like a huge job. Especially when done alone, in silence, under pressure, at the last minute. Don’t let that happen to you – any of you! Preparing for Christmas should be fun, joyful and definitely NOT a burden. So as far as the tree is concerned, I highly recommend decorating it with a loved one (maybe even a grandchild!) while listening to wonderful music, at your own speed and time, with special and meaningful ornaments. Now that doesn’t seem too difficult. But it does require planning. 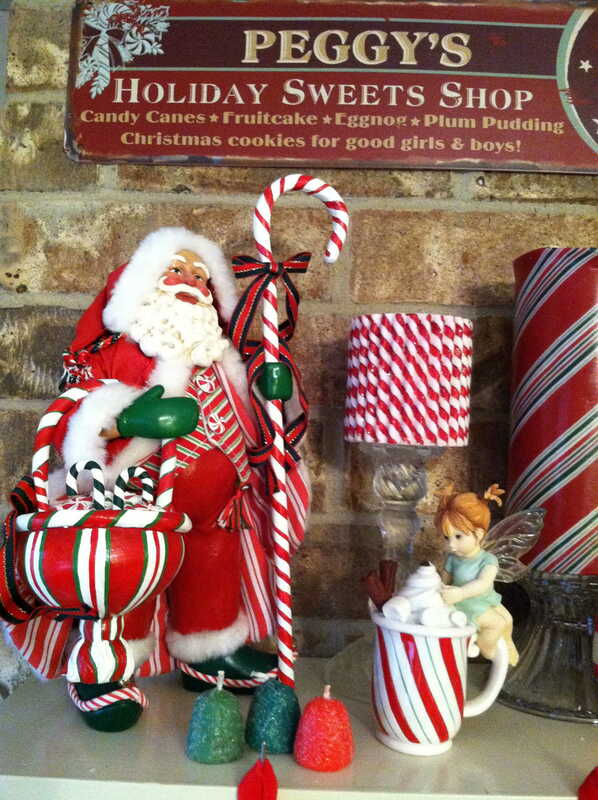 PLAN to have kids over to help with the decorating. 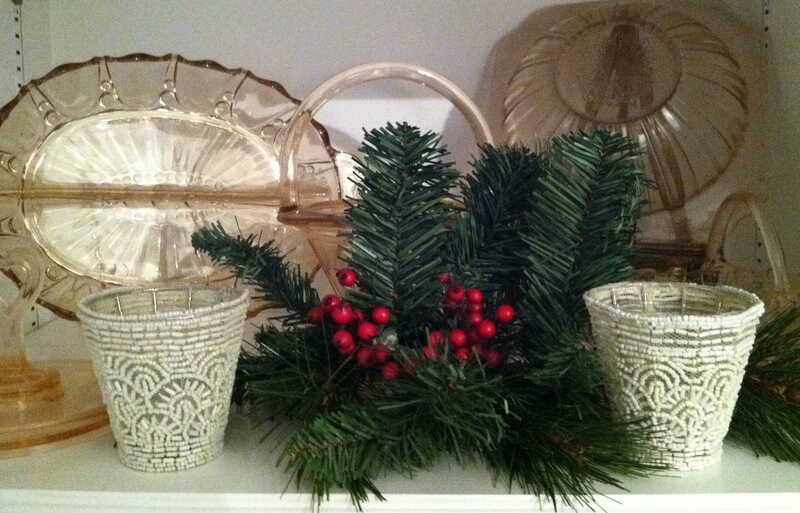 PLAN to have special ornaments and decorations to use. PLAN the Christmas music for everyone to enjoy. PLAN for a snack after the job is done. 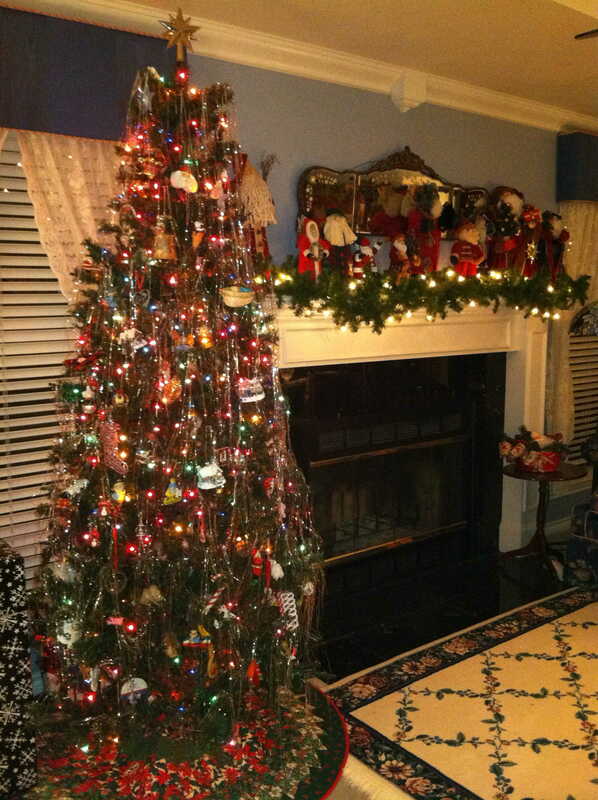 At our house, we always have a picnic under the Christmas tree after it is fully decorated. We turn on the tree lights and turn all the other lights off. Turn the music up – usually carols we can sing along with. 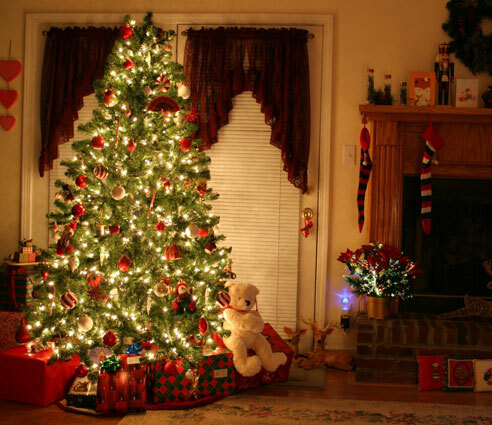 Put a quilt or blanket under the tree that’s big enough for everyone to sit on. Share some cookies or popcorn, cocoa or cider. We all sing favorite carols, in parts when we can. (Granny is an alto and Gramps has a beautiful bass voice.) We talk about past holidays, funny stories, favorite foods, best Christmas gifts ever and any other topic that happens to tickle our fancy. The next two hours are spent lounging shoeless on the quilt, sometimes even in our jammies, singing, eating, talking, laughing, reminiscing and getting ready for Christmas. I can’t think of a better way to do it. Can you? So, my Sweeties, don’t miss out on the true joys of getting ready for this special holiday by not planning the good family times. Keeping relationships doesn’t just happen – it takes intention and planning. 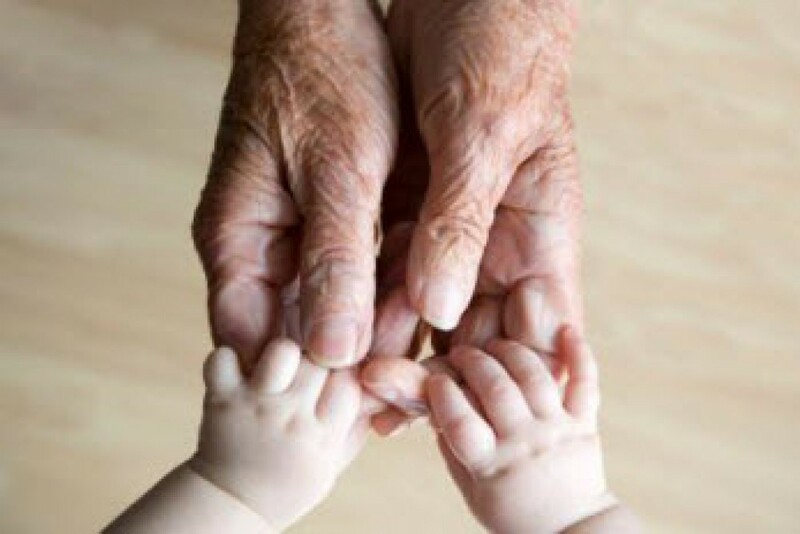 And that, dear Matriarchs, is OUR JOB!